One of the most searched topics on our site is "how to map a drive". Unfortunately, until now, the searches on this topic didn't return any result for our users. 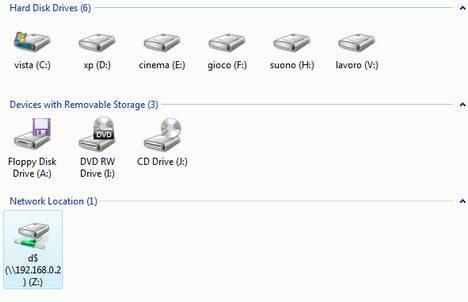 As a consequence to this, we decided to create this article in which we show you how to create a drive mapping in Windows Vista, 7, 8 and Windows 10. For those of you who don't know it, a drive mapping is a letter assigned to a disk or drive. The most common drive mappings are A: for the floppy disk and C: for the primary hard disk. 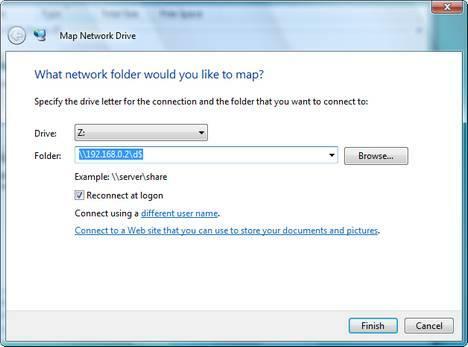 If you are on a network, a drive mapping can reference remote drives to which you can assign a letter of your choice. For example, you can use the letter Z: to refer drive C: or a network server or a specific shared folder to which you have access to. In Vista, first, click on the Computer shortcut from your desktop or from the Start Menu. In the toolbar you will find several buttons, including one called Map network drive. In Windows 7 and 8, click the "File Explorer" icon from your taskbar and then click the "Computer" link from the left vertical navigation bar. Then just click "Map network drive". In Windows 10, on your desktop, click "This PC" icon in the top-left corner of the page. Then click the "Map network drive" icon. Click on it and the Map Network Drive window will open. Now, you'll need to assign a drive letter for the connection and then type the drive or the folder you want to connect to. The folder can be located on a remote server or computer you have access to, a FTP site or a shared folder on your own computer. If you want to connect to a remote computer just type "\\" followed by the computer name or the IP address and then "\" followed by the location of the folder you want to connect to. If you want to create a drive mapping to a folder on your own computer type "\\127.0.0.1\" (this stands for the local host) or "\\computer_name\" and then the path towards that folder. Sometimes, when you create a drive mapping, you might need to use a special user name and password that allows you to connect to it. In this case, click on the Connect using a different user name link. Type the appropriate user name and password and click on OK. Now you will return to the previous window. Click on Finish and the drive mapping will be created. If you access the Computer shortcut again you will see that a new drive having the letter you assigned is listed and you can access it at anytime. I dont seem to have a map network drive button? Just organize, views, and burn. This button only appears when you are looking at "Computer" (as the instructions say). If you are looking at a folder you will only see the buttons you say you can see. According to other sites I've seen many others have had the same problems with other programs. I'm trying to install a program on a company computer. The setup files are located on the mapped network drive (on a server). When I try to run the setup it says something like "This application must be installed to a location specified by a drive letter and directory. It cannot be installed to a UNC path. It appears that \\servername\programs\blah does not contain a drive letter. If you browsed to the location usinga Network Neighboorhod please retry using a mapped drive letter." The program will run the installation if setup files are copied to the computer running vista, however it won't run properly unless it's run from the networked location. I am getting the same error message even though I have he drive mapped to the letter P. I unmapped and remapped but still getting the same error. Did you get a fix for this? The issue might be caused by the fact that the path you enter contains spaces. For example: \\server100\program files\adober reader\. In this case you might need to put the path between ". Like this: "\\server100\program files\adober reader\". Try it out. It might work! Ok Im not sure if this is vista problem,I have a laptop (xp pro SP2)based one that just flat out refuses to connect to my vista based PC,I've got the vista based PC to connect to the laptop but not the other way around,I've map drives befor to other xp based PC from the laptop. I need to transfer 30 GB of files from a XP machine to a vista machine. I tried to do it over a network. I can ping my vista machine from XP, I've disabled the firewall. When i map the network drive from my XP to Vista, it recognizes the computer and replace the ip address with computer name, i use my admin user account UN and PWD for credentials but it does not accept them. Its driving me nuts. Any hints? I've turned on sharing in Vista's C$ drive, and everything else, it just does not like my UN and pwd. I have a Program called Web Easy 6 and when I try to upload my website to my host server through the program I am getting a winsock error, I have tried disabling my McAfee and it still won't work. Just copy the files over the existing ones. Copy/Paste, like in Windows Explorer or Computer. Everytime I shut down my computer it forgets my network user name and password even though I click remember password. No one at mircosort or gateway can help me either. If anyone can help I would apprciate it. 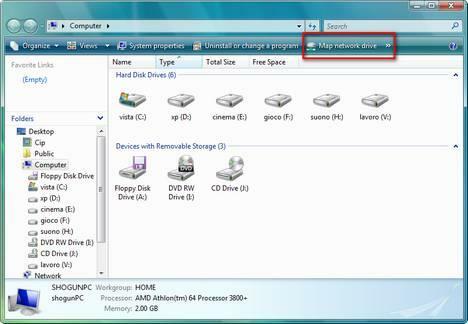 There's a program called Network Drive Manager which does it automatically. I guess you work with a home edition of Microsoft Windows? I'm having the same issue as many others, after I map a drive in Windows Vista (Ultimate 64bits) and explicity tell it to remember user&password, after a reboot or relog, the drive does not map, and windows tell me it has a problem with mapping it, so after I open explorer and go to the mapped drive it asks me for the username & password I already told it to save, and then I can access normally. Adding the credentials on Control Panel/User Accounts did not help either. (Server host is also set into trusted zone). So there seem to be nothing to solve this f*cking issue. Vista never remembers the right username for the mappings. Hi guys this problem has been driving me crazy since purchase of a Freecom 500gb Ethernet HD the supposed solution to a lack of storage. I have Vista Home Premium on my laptop but I cannot configure it to see my HD as a drive on the laptop. If i look under network center it recognises the device is there but not as a drive, when i try to map the drive i get various errors (sorry I havent got these with me) but the fact remains I just cant get it to be seen as a drive. If I try using the command \\192..... within the mapping screen it connects to the web interface of the drive. The Freecom Network Drive comes with a CD that holds the program "Freecom Network Storage Assistant". I have vista PC and cannot map network drive. I purchased six of these Gateway machines and five mapped fine but one will not. I can ping the IP address and I can ping the name of the server, but it will not map. I have turned off the firewall and don't know what else to do can you give suggestions? Maybe file sharing is disabled on that machine and this is why it doesn't work. I was wondering how to Map Network Drive a XP Pro (SP2) laptop from my Vista desktop? Any help? I was having problem because of Symantec Endpoint Protection's firewall. Once I create a rule to let the IP I wanted to map go through everything works like a charm. is there is any programs that enable me to map network in windows xp like vista does?? I have succussfully mapped drive letters to server folders over the internet using Novell NetDrive on WinXP.. but that doesnt work on Vista. The method shown here does work fine for a lan but over internet doesn't work at all.. Is there a step to do this that isnt listed here? BTW there are NO active firewalls that would prevent me from doing this. Ok im trying to map my mac to my vista computer...but im having one small problem. thats where i want to connect to....and im pretty sure that was the username that i used to logon last time....but have no idea what the password is? any ideas how to change it? How to map a drive between a XP PC and a Vista PC? I have two PC one has XP and the other has Vista. I am having problem mapping a HD driver. And I am using a wireless router to connect two computer together. hello! i have the problem! i try to connect to another pc using map network drive... i wrote an ip and folder name correctly.. but it shows log that i have to write the pasword.. but the password does not exists on that pc.. what i need to do? I just mapped my network drive from a pc at another room, it worked instantly and flawlessly. My DVD is mapped as a network drive by mistake. I am running Vista Home Prem and I map the folder which I want other network users to access and have full control over, I see the drive on my computer but no computer, not even the one in which it exist on, can write to the folder only see what is there. I try to change permissions but have not had any luck. If I go to the folder through explorer I can write but not through the mapped drive. I'm trying to map a drive on my own computer so I can quickly access data. It the folder is shared, but when I try to connect to it through adding a network drive or the net use command it comes back saying the path cannot be found. The weird thing is that it will randomly connect on boot ups. Then on others it can't find the path. Any ideas? Sorry for double post, but I unshared the file and tried to turn file sharing back on. It is saying "cannot communicate with \\my ip addres"
- User "Bill" on PC1 is not the same user as "Bill" on PC2! Those are completely different "Bill"s even if they have the same password! - Instead of typing "Bill" as username, try "Computername\Username", for example "BillsComputer\Bill". By this you explicitly express that "Bill" is not a user on YOUR computer, but on the computer "BillsComputer" which you are trying to access. Hope it's kinda understandable what I mean, please report if this helped. OMG I love you I've been trying to find this fix for weeks. I installed a network driver for my device it worked fine a couple of times but then it started acting up so I deleted it and installed the driver again. But this time it wont let me install the driver again I get an error message saying " The network name is no longer available." I don't know why this is happening. I even put in the port for this device to run through. Please HELP!! I am working as a technical support Engineer , I was afraid to map the network drive . Thank you for this link . You Guys did a great Job ! Now I just need to give the Link and All SET ! 2, click "computer" on the upper left hand corner then click ''map network drive''. 3, A Map network Drive dialog will appear. 5, If you didn't make a file yet, Click browse then click the arrow beside the ''Public'' file. 7, After creating, click Ok.